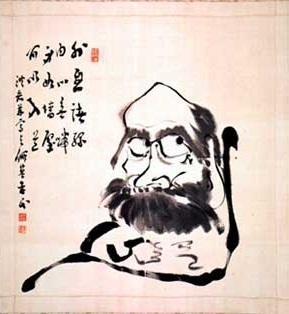 Kōgaku Sōen 洪嶽宗演・洪岳宗演 (1860–1919) was known during his lifetime as Shaku Sōen 釋宗演・釈宗演 and his "chamber name" as a teacher (rōshi) was Ryōgakutsu 楞伽窟. He was a disciple of 今北洪川 Imakita Kōsen (1816-1892). He gained notoriety not only as a teacher in the Rinzai denomination of Zen and abbot of the Engakuji monastery, but through his role of chief of the Japanese delegation in the 1893 World's Parliament of Religions in Chicago. Subsequently, Suzuki Daisetsu Teitarō 鈴木大拙貞太郎 (1870–1966), one his disciples, lived in the United States and worked with Paul Carus (1852–1919) at the Open Court Publishing Company. Part of the correspondance between Sōen and Carus subsists. of the Tōkeiji in 1941. Japanese Journal of Religious Studies 10/2-3 1983, p. 224. 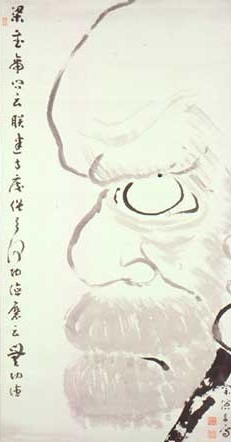 Suzuki received his religious name "Daisetz" (Great Simplicity) from Kōgaku Sōen (Sōen Shaku) (1859-1919), abbot of Engaku-ji Temple. The precise date Suzuki received this name is unknown. However, Sōen wrote in December 1894, "Mr. Suzuki Daisetz, my disciple," indicating that the scroll had likely been written before this date. This panel was written by Sōen. Auerback, Micah. 2012. A Closer Look at Zen at War: The Battlefield Chaplaincy of Shaku Soen in the Russo-Japanese War (1904–1905). In Buddhism and Violence: Militarism and Buddhism in Modern Asia, edited by Vladimir Tikhonov, and Torkel Brekke. New York: Routledge, pp. 152–171. In: Zen Masters, edited by Steven Heine, and Dale Stuart Wright. New York: 2010, pp. 183–216. translated from the Japanese by Daisetz Teitaro Suzuki. Cover page of Wind Bell, Fall 1969, Vol. VIII, Nos. 1-2. Wind Bell, Fall 1969, Vol. VIII, Nos. 1-2. pp. 7-9. 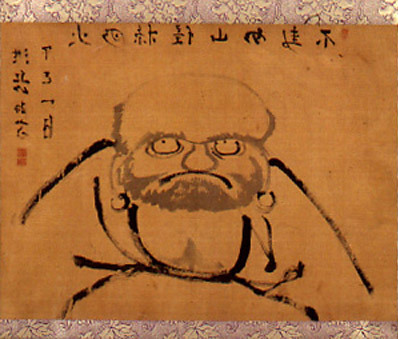 Soyen Shaku was a unique figure among the Buddhist priests of his day. education which was both modern and ancient. associates and followers, both monks and laymen, he accepted the invitation. He was the first Zenshu priest to come to America. resputed him for his eagerness of learning both in Zen and worldly knowledge. America as their guest and remained with chem until the following spring. was not used to it and nor in perfect health. was the first American who experienced the actual study of Zen koans. so, America had to pick up this monk- a poorer one. I am very sorry about it. his journey homeward by way of Europe and India. simple pilgrim. Though his funds were exhausted he did not notify his temple. humble acquiescence in the ancient rules of the Sangha. countryman but also the famous Soyen. all consider him living with us as long as we keep our Zen. Richard Bryan McDaniel: Zen Masters of Japan. The Second Step East. Rutland, Vermont: Tuttle Publishing, 2013. His older brother, Chutaro, felt drawn to monastic life, but family responsibilities after the death of their father prevented him from doing so. Tsunejiro decided to take the precepts in his brother’s stead and became a monk at the age of twelve. He was originally given the Buddhist name Soko. However, because another monk had the same name, their teacher invited Tsunejiro to choose his own name. He elected Soyen in honor of a younger monk of that name who had died. 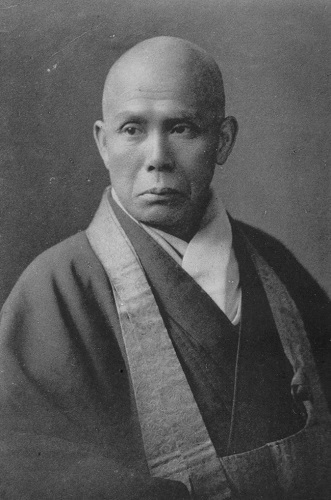 Although Kosen fought the restrictions initially placed upon Buddhism by the Meiji regime, he came to be a supporter of the government’s policies and even accepted an appointment to serve as an Instructor for the Ministry of Doctrine. He shared the government’s belief that it was essential for Japan to adopt those western institutions that could best assist in its modernization. So after Soyen completed his Zen training, rather than having him go on the traditional pilgrimage to Zen temples in the country, Kosen encouraged him to enroll in the new Keio University. Soyen stayed there for three years, after which he made use of the greater freedom the Japanese now had to travel outside their country to visit Ceylon (now Sri Lanka). His goal was to deepen his understanding of Buddhism by familiarizing himself with the older Theravada tradition, but the young Japanese found conditions in the island nation extremely difficult. He wrote back to Kosen that the only thing in Ceylon that seemed the same as at home was the barking of the dogs. In particular, he was unprepared for the tropical heat which was so severe he was unable to take part in the traditional begging rounds with the other monks. 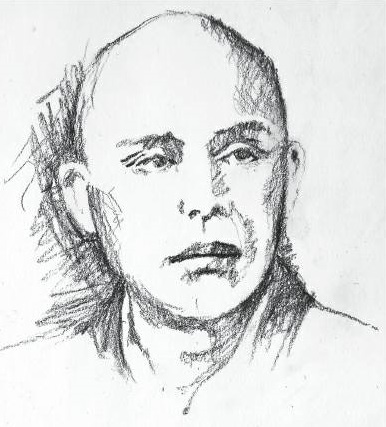 He admired the life-style of the Ceylonese monks—bhikkus—and their commitment to the precepts; however, he was never able to communicate with them very well, and he realized that they would be bewildered if he attempted to explain Zen with its emphasis on personal enlightenment. In a talk given to his American students in 1947, Nyogen Senzaki told this story about Soyen’s return trip to Japan after spending three years in Ceylon. He went from Singapore to Thailand on a steamship. He had almost no money and could only afford to travel as a deck passenger. He was still unused to the tropical heat, and the glare of the sun on the open deck of the ship was a misery. There was little water, and he had no food. Then, to make his situation even worse, the ship had to anchor on the coast at the mouth of a river in order to wait for the turn of the tide. The deck passengers were immediately attacked by hordes of mosquitoes. As evening approached, dark clouds appeared in the distance that only made the humidity more oppressive, and he could get no rest because of the heat and the voracious pests. Finally, he found a small area on the deck that provided him a little privacy. There he removed most of his clothing and formed it into a cushion to sit upon, then tried to enter meditation—allowing the mosquitoes to feed as much as they liked on his bare skin. For a long while the drone of the feeding insects prevented him from entering into the state of samadhi, but eventually he succeeded and his mind became fully concentrated. He was no longer aware of the mosquitoes, the heat, or his thirst. When a rainstorm roused him from his meditation, he heard in the distance a temple bell ringing, and he smiled in contentment. Looking about he saw that a number of bright red wild berries of some kind had fallen about him. Examining them more closely, he discovered they were not berries at all, but mosquitoes so engorged with his blood that they were unable to fly. A year after Soyen returned to Japan, Kosen died, and his young disciple was appointed principal teacher at Engakuji. As had Kosen, Soyen supported the policies of the Meiji government, including their military excursions into China and Russia. During the Russo-Japanese War [1904-05], he took time from his duties at Engakuji to serve as a chaplain in the First Army Division and would later argue that the Japanese victory was due, in part, to the strength the nation drew from Buddhist culture and specifically from Zen training which aided in instilling a “samurai spirit” in the population. It was a point of view in which many people in the higher levels of government began to see some validity. By the end of the Russo-Japanese War, Zen practice was no longer considered suspect. The Meiji Era came to an end with the death of the Emperor in 1912. The period lasted less than forty-five years, a relatively short time in history. However the changes that were wrought in Japan during those years were brisk and effective. By the end of the Meiji Era, Japan was recognized as a world power on a par with the United States and the more developed nations of Europe. Japan was now a major player on the global stage, and the scene was set for Zen to move beyond the confines of Asia. By the end of the 19th Century, Asian studies had not only acquired a degree of respectability in the West, they had also attracted a popular interest that would not have been imaginable only a few decades earlier. But then the post-Darwinian world was a place of rapid change. While Christian doctrine was under attack from scientific rationalism, a group of scholars and translators wondered if non-theistic Buddhism—especially as expressed in the Theravada tradition—might not provide the basis for a faith system better suited to bridge the growing rift between science and religion. In popular culture, charlatans like the Russian-born founder of Theosophy—Helena Petrovna Blavatsky—made claims about the mysterious doctrines of the East that found willing adherents among the gullible and desperate. Liberal Christians sought for a means of regaining lost ground and establishing a rapprochement with the scientific community. They chose the Chicago World’s Fair of 1893 as their venue. Also known as the Columbian Exposition, the Fair marked the 400th anniversary of Columbus’s first voyage to the Americas and was touted to be a celebration of Western technological achievement. A World Parliament of Religions was proposed which would take place at the same time. It was to be a gathering of representatives from the major religious traditions of the globe. The organizers hoped to be able to identify principles shared by all faiths and then, no doubt, to demonstrate that Christianity provided the most fully evolved exposition of those principles. Soyen was in Chicago for the presentation of his paper, which was read on his behalf by one of the Parliament’s organizers. In the audience at the time was a German Orientalist resident in nearby LaSalle, Illinois, Paul Carus. Carus approached Soyen and asked if he would consider assisting him in a project to make translations of Buddhist writings available in the West. Soyen demurred, explaining that he was not qualified to do so nor could he take further time from his duties at Engakuji. He did, however, suggest that the young student who had translated his paper into English might be up to the task. So it was that D. T. Suzuki came to Illinois in 1897, and—with him—Zen took its third step east, across the Pacific Ocean, to the Americas. This publication constitutes Sōen's account of his journey to Ceylon (Sri Lanka) and Thailand from March 8, 1887 to October 12, 1889. It was sent to Japan and published in January 1889, before his return. It contains drawings, as well as prefatory remarks in Sinhalese from Dharmapala, his teacher in Ceylon. The two forewords were written by Sōen's teacher in Japan, Kōsen Sōon 洪川宗温 (Imakita 今北 1816–1892), and by his sponsor, Tokuan Torio Koyata 得庵 鳥尾小彌太 (1847–1905). 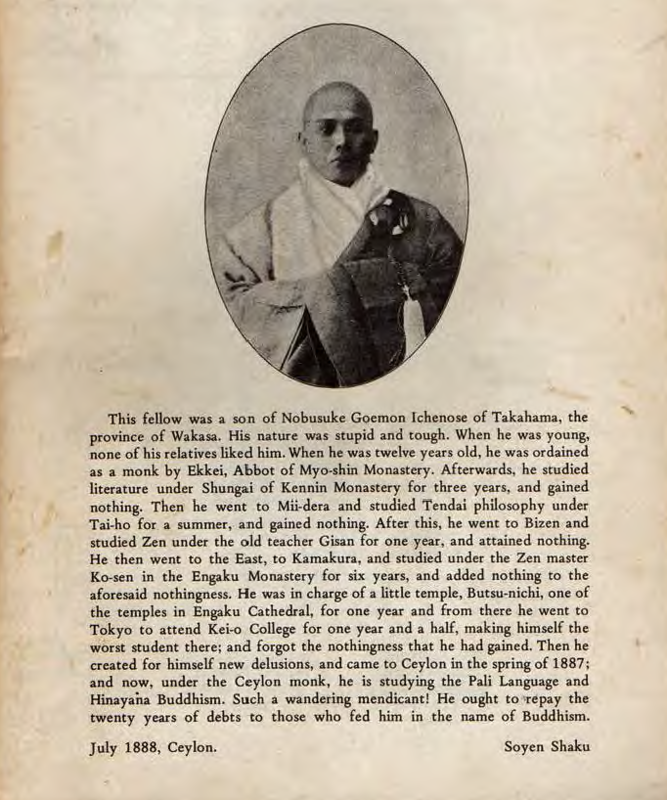 The title of this publication "Buddhism in the South-west" illustrates how Ceylon was viewed from the Japanese perspective, as opposed to the Eurocentric perspective that would describe it as "South-east Asia." For further information about this publication, see Jaffe, Richard M. 2004. Seeking Śākyamuni: Travel and the Reconstruction of Japanese Buddhism. Journal of Japanese Studies 30 (1): 65–96. You see your true nature-become Buddha. Painted by Kogaku respectfully. Very open and boundless like the sky. Bodhidharma's mind cannot be known. He made every effort to save all sentient beings from suffering before he attained Nirvana.